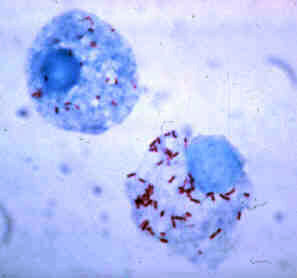 Although the disease is similar in presentation to other forms of typhus, its pathogen is no longer included in genus Rickettsia with the typhus bacteria proper, but in Orientia . The disease is thus frequently classified separately from the other typhi. Scrub typhus is transmitted by some species of trombiculid mites ("chiggers", particularly Leptotrombidium deliense ),  which are found in areas of heavy scrub vegetation. The bite of this mite leaves a characteristic black eschar that is useful to the doctor for making the diagnosis. Leptotrombidium deliense is a species of mite. Without treatment, the disease is often fatal. Since the use of antibiotics, case fatalities have decreased from 4–40% to less than 2%. World War II provides some indicators that the disease is endemic to undeveloped areas in all of Oceania in the Pacific theater, although war records frequently lack definitive diagnoses, and many records of "high fever" evacuations were also likely to be other tropical illnesses. In the chapter entitled "The Green War", General MacArthur's biographer William Manchester identifies that the disease was one of a number of debilitating afflictions affecting both sides on New Guinea  in the running bloody Kokoda battles over extremely harsh terrains under intense hardships— fought during a six-month span  all along the Kokoda Track in 1942-43, and mentions that to be hospital-evacuated, Allied soldiers (who cycled forces) had to run a fever of 102 °F, and that sickness casualties outnumbered weapons-inflicted casualties 5:1. Similarly, the illness was a casualty producer in all the jungle fighting of the land battles of the New Guinea campaign and the Guadalcanal campaign. Where the Allies had bases, they could remove and cut back vegetation, or use DDT as a prophylaxis area barrier treatment, so mite- and tick-induced sickness rates in forces off the front lines were diminished. Wuchereria bancrofti is a human parasitic roundworm that is the major cause of lymphatic filariasis. It is one of the three parasitic worms, together with Brugia malayi and B. timori, that infect the lymphatic system to cause lymphatic filariasis. These filarial worms are spread by a variety of mosquito vector species. W. bancrofti is the most prevalent of the three and affects over 120 million people, primarily in Central Africa and the Nile delta, South and Central America, the tropical regions of Asia including southern China, and the Pacific islands. If left untreated, the infection can develop into a chronic disease called elephantiasis. In rare conditions, it also causes tropical eosinophilia, an asthmatic disease. No vaccine is commercially available, but high rates of cure have been achieved with various antifilarial regimens and lymphatic filariasis is the target of the WHO Global Program to Eliminate Lymphatic Filariasis with the aim to eradicate the disease as a public-health problem by 2020. Buruli ulcer is an infectious disease caused by Mycobacterium ulcerans. The early stage of the infection is characterised by a painless nodule or area of swelling. This nodule can turn into an ulcer. The ulcer may be larger inside than at the surface of the skin, and can be surrounded by swelling. As the disease worsens, bone can be infected. Buruli ulcers most commonly affect the arms or legs; fever is uncommon. Deer tick virus (DTV) is a flavivirus causing tick-borne encephalitis. Choclo virus (CHOV) is a single-stranded, negative-sense RNA zoonotic New World hantavirus. It was first isolated in 1999 in western Panama. 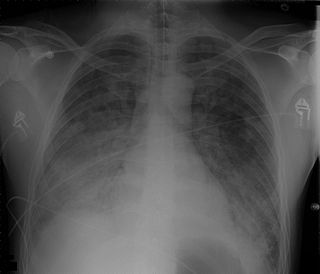 The finding marked the first time Hantavirus pulmonary syndrome (HPS) was found in Central America. Cryptosporidium muris is a species of coccidium, first isolated from the gastric glands of the common mouse. Cryptosporidium does originate in common mice, specifically laboratory mice. However, it also has infected cows, dogs, cats, rats, rabbits, lambs, and humans and other primates. Tensaw virus is a virus in the genus Orthobunyavirus of the Bunyamwera arbovirus group, order Bunyavirales. It is named for the river bordering the area in south Alabama where the prototype strain was discovered. It is abbreviated TEN, TENV, and TSV in the scientific literature. ↑ Tseng BY, Yang HH, Liou JH, Chen LK, Hsu YH (February 2008). "Immunohistochemical study of scrub typhus: a report of two cases". Kaohsiung J. Med. Sci. 24 (2): 92–8. doi:10.1016/S1607-551X(08)70103-7. PMID 18281226. ↑ Jain P, Prakash S, Tripathi PK, et al. (2018). "Emergence of Orientia tsutsugamushi as an important cause of acute encephalitis syndrome in India". PLoS Negl Trop Dis. 12 (3): e0006346. doi:10.1371/journal.pntd.0006346. PMC 5891077 . PMID 29590177. ↑ Pham XD, Otsuka Y, Suzuki H, Takaoka H (2001). "Detection of Orientia tsutsugamushi (Rickettsiales: Rickettsiaceae) in unengorged chiggers (Acari: Trombiculidae) from Oita Prefecture, Japan, by nested polymerase chain reaction". J Med Entomol. 38 (2): 308–311. doi:10.1603/0022-2585-38.2.308. PMID 11296840. ↑ Seong SY, Choi MS, Kim IS (January 2001). "Orientia tsutsugamushi infection: overview and immune responses". Microbes Infect. 3 (1): 11–21. PMID 11226850. ↑ Phongmany S, Rolain JM, Phetsouvanh R, et al. (February 2006). "Rickettsial infections and fever, Vientiane, Laos". Emerging Infect. Dis. 12 (2): 256–62. doi:10.3201/eid1202.050900. PMC 3373100 . PMID 16494751. ↑ Suttinont C, Losuwanaluk K, Niwatayakul K, et al. (June 2006). "Causes of acute, undifferentiated, febrile illness in rural Thailand: results of a prospective observational study". Ann Trop Med Parasitol. 100 (4): 363–70. doi:10.1179/136485906X112158. PMID 16762116. ↑ Katayama T, Hara M, Furuya Y, Nikkawa T, Ogasawara H (June 2006). "Scrub typhus (tsutsugamushi disease) in Kanagawa Prefecture in 2001–2005". Jpn J Infect Dis. 59 (3): 207–8. PMID 16785710. Archived from the original on 2010-05-25. ↑ Yamamoto S, Ganmyo H, Iwakiri A, Suzuki S (December 2006). "Annual incidence of tsutsugamushi disease in Miyazaki prefecture, Japan in 2001-2005". Jpn J Infect Dis. 59 (6): 404–5. PMID 17186964. Archived from the original on 2009-08-15. ↑ Bang HA, Lee MJ, Lee WC (2008). "Comparative research on epidemiological aspects of tsutsugamushi disease (scrub typhus) between Korea and Japan". Jpn J Infect Dis. 61 (2): 148–50. PMID 18362409. Archived from the original on 2008-09-27. 1 2 Koh GC, Maude RJ, Paris DH, Newton PN, Blacksell SD (March 2010). "Diagnosis of scrub typhus". Am. J. Trop. Med. Hyg. 82 (3): 368–70. doi:10.4269/ajtmh.2010.09-0233. PMC 2829893 . PMID 20207857. 1 2 3 Pradutkanchana J, Silpapojakul K, Paxton H, et al. (1997). "Comparative evaluation of four serodiagnostic tests for scrub typhus in Thailand". Trans R Soc Trop Med Hyg. 91 (4): 425–8. doi:10.1016/S0035-9203(97)90266-2. PMID 9373640. ↑ Bozeman FM & Elisberg BL (1963). "Serological diagnosis of scrub typhus by indirect immunofluorescence". Proc Soc Exp Biol Med. 112 (3): 568–73. doi:10.3181/00379727-112-28107. PMID 14014756. ↑ Yamamoto S & Minamishima Y (1982). "Serodiagnosis of tsutsugamushi fever (scrub typhus) by the indirect immunoperoxidase technique". J Clin Microbiol. 15 (6): 1128–l. PMC 272264 . PMID 6809786. ↑ Kelly DJ, Wong PW, Gan E, Lewis GE Jr (1988). "Comparative evaluation of the indirect immunoperoxidase test for the serodiagnosis of rickettsial disease". Am J Trop Med Hyg. 38 (2): 400–6. PMID 3128129. ↑ Blacksell SD, Bryant NJ, Paris, DH, et al. (2007). "Scrub typhus serologic testing with the indirect immunofluorescence method as a diagnostic gold standard: a lack of consensus leads to a lot of confusion". Clin Infect Dis. 44 (3): 391–401. doi:10.1086/510585. PMID 17205447. ↑ Eamsila C, Singsawat P, Duangvaraporn A, et al. (1996). "Antibodies to Orientia tsutsugamushi in Thai soldiers". Am J Trop Med Hyg. 55 (5): 556–9. PMID 8940989. ↑ Watt G, Parola P (2003). "Scrub typhus and tropical rickettsioses". Curr Opin Infect Dis. 16 (5): 429–436. doi:10.1097/00001432-200310000-00009. PMID 14501995. ↑ Tay ST, Nazma S, Rohani MY (1996). "Diagnosis of scrub typhus in Malaysian aborigines using nested polymerase chain reaction". Southeast Asian J Trop Med Public Health. 27 (3): 580–3. PMID 9185274. ↑ Kim, DM; Yun, NR; Yang, TY; Lee, JH; Yang, JT; Shim, SK; Choi, EN; Park, MY; Lee, SH (2006). "Usefulness of nested PCR for the diagnosis of scrub typhus in clinical practice: A prospective study". Am J Trop Med Hyg. 75 (3): 542–545. PMID 16968938. ↑ Sonthayanon P, Chierakul W, Wuthiekanun V, et al. (December 2006). "Rapid diagnosis of scrub typhus in rural Thailand using polymerase chain reaction". Am. J. Trop. Med. Hyg. 75 (6): 1099–102. PMID 17172374. ↑ Kim DM, Byun JN (2008). "Effects of Antibiotic Treatment on the Results of Nested PCRs for Scrub Typhus". J Clin Microbiol. 46 (10): 3465–. doi:10.1128/JCM.00634-08. PMC 2566087 . PMID 18716229. ↑ Watt G, Chouriyagune C, Ruangweerayud R, et al. (1996). "Scrub typhus infections poorly responsive to antibiotics in northern Thailand". Lancet. 348 (9020): 86–89. doi:10.1016/S0140-6736(96)02501-9. PMID 8676722. ↑ Kollars TM, Bodhidatta D, Phulsuksombati D, et al. (2003). "Short report: variation in the 56-kD type-specific antigen gene of Orientia tsutsugamushi isolated from patients in Thailand". Am J Trop Med Hyg. 68 (3): 299–300. PMID 12685633. ↑ Panpanich, R.; Garner, P. (2002). "Antibiotics for treating scrub typhus". The Cochrane Database of Systematic Reviews (3): CD002150. doi:10.1002/14651858.CD002150. ISSN 1469-493X. PMID 12137646. ↑ Phimda K, Hoontrakul S, Suttinont C, et al. (2007). "Doxycycline versus Azithromycin for Treatment of Leptospirosis and Scrub Typhus". Antimicrob Agents Chemother. 51 (9): 3259–63. doi:10.1128/AAC.00508-07. PMC 2043199 . PMID 17638700. ↑ Mahajan SK, Rolain JM, Sankhyan N, Kaushal RK, Raoult D (2008). "Pediatric scrub typhus in Indian Himalayas". Indian Journal of Pediatrics. 75 (9): 947–9. doi:10.1007/s12098-008-0198-z. PMID 19011809. ↑ Watt, G; Kantipong, P; Jongsakul, K; Watcharapichat, P; Phulsuksombati, D (1999). "Azithromycin Activities against Orientia tsutsugamushi Strains Isolated in Cases of Scrub Typhus in Northern Thailand". Antimicrob Agents Chemother. 43 (11): 2817–2818. PMC 89570 . PMID 10543774. ↑ Choi EK, Pai H (1998). "Azithromycin therapy for scrub typhus during pregnancy". Clin Infect Dis. 27 (6): 1538–9. doi:10.1086/517742. PMID 9868680. 1 2 Kim YS, Lee HJ, Chang M, Son SK, Rhee YE, Shim SK (2006). "Scrub typhus during pregnancy and its treatment: a case series and review of the literature". Am J Trop Med Hyg. 75 (5): 955–9. PMID 17123995. ↑ <Please add first missing authors to populate metadata.> (2003). "Efficacy of azithromycin for treatment of mild scrub-typhus infections in South Korea". Abstr Intersci Conf Antimicrob Agents Chemother. 43: abstract no. L–182. ↑ Mathai E, Rolain JM, Verghese L, Mathai M, Jasper P, Verghese G, Raoult D (2003). "Case reports: scrub typhus during pregnancy in India". Trans R Soc Trop Med Hyg. 97 (5): 570–2. doi:10.1016/S0035-9203(03)80032-9. PMID 15307429. ↑ Watt G, Kantipong P, Jongsakul K, et al. (2000). "Doxycycline and rifampicin for mild scrub-typhus infections in northern Thailand: a randomised trial". Lancet. 356 (9235): 1057–1061. doi:10.1016/S0140-6736(00)02728-8. PMID 11009140. ↑ Arguin PM, Kozarsky PE, Reed C (2008). "Chapter 4: Rickettsial Infections". CDC Health Information for International Travel, 2008. Mosby. ISBN 978-0-323-04885-9. ↑ "AWIC Newsletter: The Cotton Rat In Biomedical Research". Archived from the original on 2004-06-10. ↑ "Scrub Typhus Vaccine, Far East". Hansard. Millbanksystems. April 2, 1946. ↑ Thomson Walker W (1947). "Scrub Typhus Vaccine". Br Med J. 1 (4501): 484–7. doi:10.1136/bmj.1.4501.484. PMC 2053023 . PMID 20248030. ↑ Shirai A, Tanskul PL, Andre, RG, et al. (1981). "Rickettsia tsutsugamushi strains found in chiggers collected in Thailand". Southeast Asian J Trop Med Public Health. 12 (1): 1–6. PMID 6789455. ↑ Kang JS, Chang WH (1999). "Antigenic relationship among the eight prototype and new serotype strains of Orientia tsutsugamushi revealed by monoclonal antibodies". Microbiol Immunol. 43 (3): 229–34. doi:10.1111/j.1348-0421.1999.tb02397.x. PMID 10338191. ↑ Kelly DJ, Fuerst PA, Ching WM, Richards AL (2009). "Scrub typhus: The geographic distribution of phenotypic and genotypic variants of Orientia tsutsugamushi". Clinical Infectious Diseases. 48 (s3): S203–30. doi:10.1086/596576. PMID 19220144. ↑ Audy JR (1968). Red mites and typhus. London: University of London, Athlone Press. ISBN 978-0-485-26318-3. ↑ Kearny CH (1997). Jungle Snafus...And Remedies. Cave Junction, Oregon: Oregon Institute of Science & Medicine. p. 309. ISBN 978-1-884067-10-5. ↑ Smallman-Raynor M, Cliff AD (2004). War epidemics: an historical geography of infectious diseases in military conflict and civil strife, 1850–2000. Oxford: Oxford University Press. pp. 489–91. ISBN 978-0-19-823364-0. 1 2 William Manchester (1978). "The Green War". American Caesar. Little Brown Company. pp. 297–298. ISBN 978-0-316-54498-6. ↑ Ogawa M, Hagiwara T, Kishimoto T, et al. (1 August 2002). "Scrub typhus in Japan: Epidemiology and clinical features of cases reported in 1998". Am J Trop Med Hyg. 67 (2): 162–5. PMID 12389941.